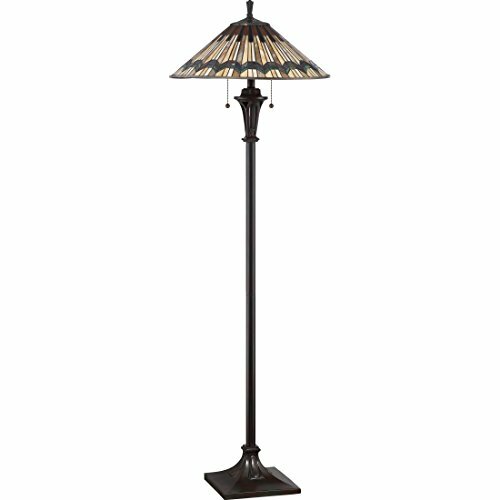 A slender, strong zinc base is finished in valiant bronze to give the Quoizel Alcott Floor Lamp alluring antique-inspired style. The round shade is made up of panels of Tiffany glass in a soft range of warm tones. Pull chains provide easy control of the two 100-watt bulbs. Classic styles are current at Quoizel, a highly popular designer working in everything from Craftsman to Tiffany to Arts & Crafts. Each of their lights is designed to illuminate your home for years to come. Dimensions: 20.5W x 20.5D x 62H in.. Shade dimensions: 20.25 diam. x 7.5H in.. Zinc base. Valiant bronze finish. Multicolored round Tiffany glass shade. Pull-chain on/off socket. Requires two 100-watt medium base A19 bulbs (not included).